Concussion is a mild traumatic brain injury that occurs when the normal functioning of the brain is disrupted by a blow or jolt to the head. Common symptoms of concussion include headache, dizziness, and memory problems. Most people recover from concussion in a week or two, but symptoms can sometimes last longer and can affect performance at work or school. During recovery, it is important to avoid over-exertion and to avoid re-injury. Before returning to sports, athletes recovering from concussion must be symptom free at rest and after physical and mental exertion. The Upstate Concussion Center, comprised of the Sports Concussion Center and Concussion Management Program, provides comprehensive evaluation and treatment services for concussion and sports concussion. For more information or to schedule an appointment, call 315 464-8986. 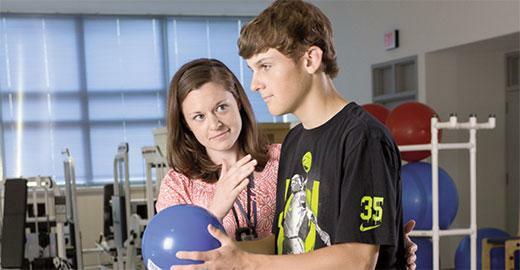 You can also view or download the Concussion Management Program brochure. The Concussion Management Program and CNY Sports Concussion Center at Upstate are dedicated to improving the understanding and proper management of concussion through community education and outreach. If you are interested in arranging a presentation or workshop related to concussion or sports concussion, call 315 464-8986. Last Modified: November 20, 2018. Contact Lori Holmes with questions about the content of this page.